A 700-page account of being a substitute teacher may sound excessive. But ever since his ingenious 1988 debut novel, “The Mezzanine” (about an office worker taking a lunchtime escalator ride to purchase some shoelaces), Nicholson Baker has been a writer I take on trust. “Substitute: Going to School with a Thousand Kids” rewards that trust. 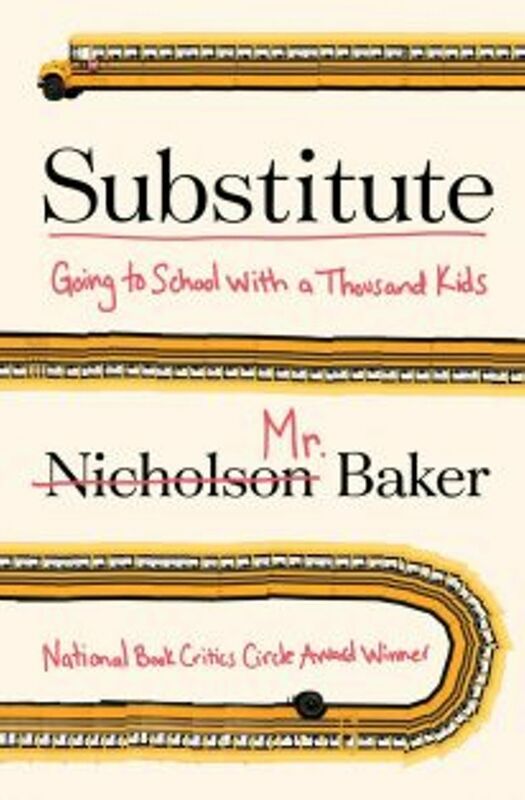 It chronicles Baker’s three months on-call as a substitute for a rural school district in Maine. Each of his 28 days on the job gets a chapter to itself, couched in transcriptionlike prose with minimal commentary. “Substitute” fills that gap. Baker either has perfect recall or was tape-recording his seven-hour school days so he could get them down in the prose-equivalent of obsessive photorealist detail. Each class he steps into has its own peculiar dynamics. Rare moments of hushed concentration on study come like bliss. Most of the time things veer more toward chaos. Yet from this endless disruption, moments of learning emerge. So do real dramas. Baker suspects that one downcast insomnia-stricken middle-schooler is on too strong a dose of Paxil and tries discreetly to address the situation. Other children have lost a parent or are trying to get back on track after being in juvenile-detention centers. Baker’s sympathies are with the misfits, especially those who are quirky or clever but dealing with obstacles — dyslexia, ADHD, emotional problems — that get in the way of learning. Another challenge is the perversity of English-language spelling: a stumbling block for some teachers as well as many students. Baker makes English’s idiosyncrasies dizzyingly fresh. His wacky descriptive gifts are also on brilliant display. “Blobs of empty time moved through the morning’s digestive tract,” he says of one quiet classroom interval. “The sound of children rose to a full riot-gear fluffernutter death-metal maelstrom,” he writes of a noisier session. The book is a sobering reminder of the minefield mentality that dominates our schools in the era of lockdown drills (“Everyone was watchful the day after a school shooting”), allergy hazards (“No peanuts allowed in my room ever”) and playground risks (one poor kindergartner has “black stuff” behind her ear — which turns out to be a tick).